Apart from Leo DiCaprio's films, white-collar criminals are usually portrayed as the worst kind of people imaginable. What could motivate someone to provoke hundreds or even thousands of people, just go from "rich" to "even richer"? Is it greed? A belief that they will not get caught? Pure black-hearted malice? How about greed? Did we mention greed? Good news, we have an answer! And it's … a stupidity of the balls. 1; "it" was crime and then a prison cell. When Soltes interviewed executives sentenced for economic crimes, it was always the reason for all their brilliance and expertise. They never thought they were doing something really wrong. In their opinion, the crimes were so low and the rewards so low that they did not really stop thinking they were breaking the law. Even Bernie Madoff, the guy behind the biggest Ponzi plan in history, was like, "Eh, that's not such a big deal." Since the crime itself is removed from any sense of consequence (eg pickpocketing), few consciously say, "OK, I'm going to be criminal now." For the vast majority This was a slow slide down or the result of a bad impulse-driven idiocy. Therefore, when Soltes squeezed out his interviewees to the point where they were knowingly involved in crime, few could say in retrospect. We can imagine how Madoff watches the Robert De Niro movie they made about him and goes on, "Ohhh, so so I'm going to jail for 150 years." Weapons are a hot topic these days, probably due to their shooting. Many of these firearms abuse discussions focus on high-profile phenomena such as mass shootings and gang crimes. But if you look at the numbers, it is clear that the most productive form of infusion, the one that harms society most, is suicide. And that's been the case for some time. 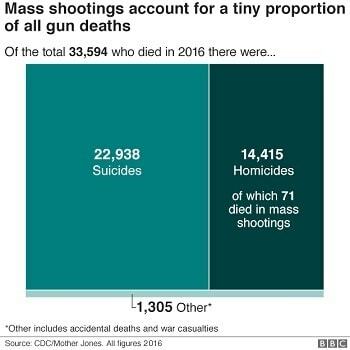 BBC To be clear, we think all the numbers in this graph are terrible, including "2016".